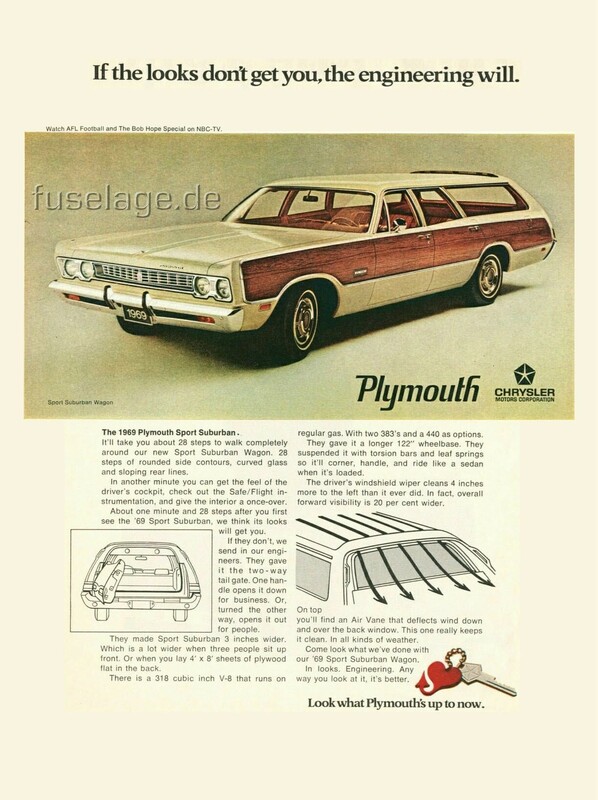 The Plymouth full-size models were all new for 1969. The Fuselage design was applied for the first time and the boxy look of previous years was gone. Most visible change up front were the dual headlamps now residing in a horizontal arrangement instead of on top of each other like in 1968. The sloping line of the rear window gave the whole car a more elegant look. Inside, the new cockpit-style dashboard not only picked up on the aircraft-inspired Fuselage theme but was also stylish and practical. 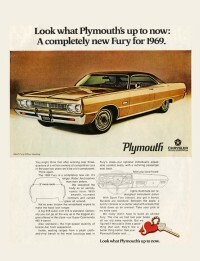 Again in 1969, the full-sized Plymouths were called the Furys. For the last time, the VIP resided on top of the line. Next in rank was the Sport Fury which shared its special grille with the VIP. Both had the 318 cui V8 engine as base powerplant. Below that, there was the Fury III and the lesser Fury II and I. Station wagon buyers could chose between the Fury Sport Suburban, Custom Suburban and Suburban. 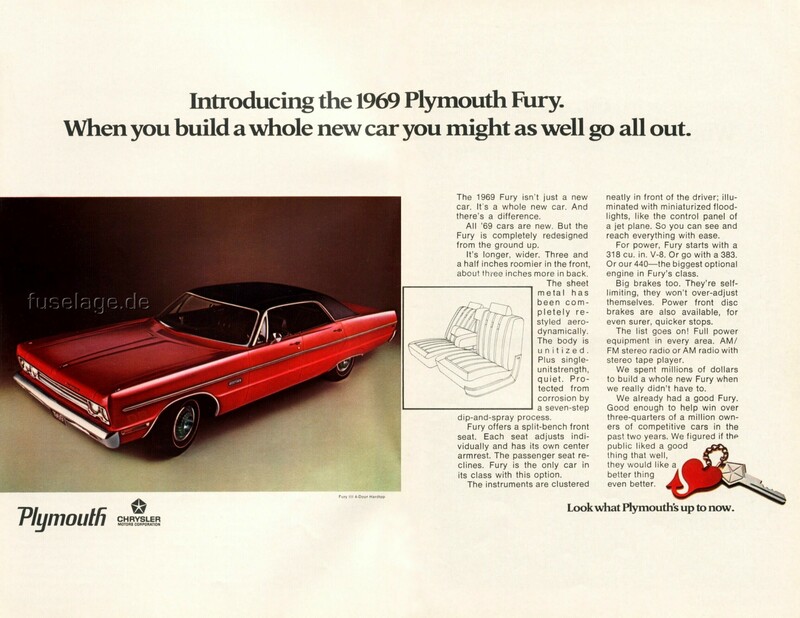 Sport Furys and Fury III's could be had as convertibles. 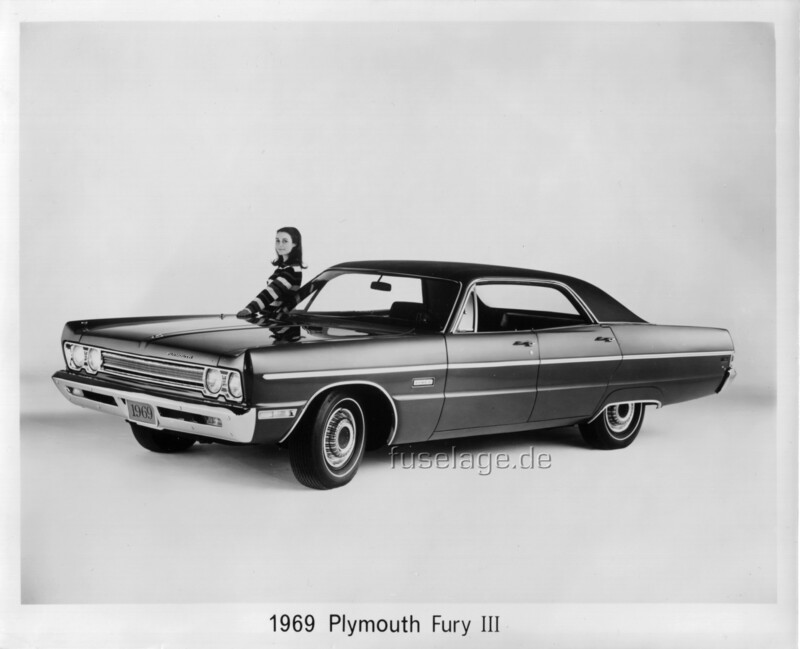 While the Fury I and Fury II came standard with the slant six engine, they could also be had with more powerful powerplants, up to a 375 hp 440 cui V8. The new styling of the 1969 Furys didn't really catch on with buyers. Model year sales reached 352,844 units, equalling the previous year's output. 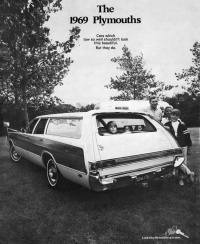 Click for the part of the 1969 Trailer Towing brochure showing information for the 1969 Plymouth Fury and Suburban. 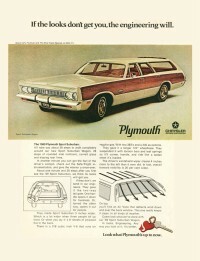 This is a magazine ad promoting the 1969 Plymouth Sport Suburban. This is ad presented the 1969 Plymouth Sport Fury two-door hardtop and explained that the interior was wider than in the previous year. 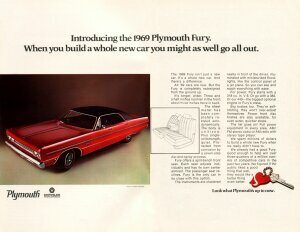 Read what a guest author in Plymouth's own Traveler Magazine had to write about the new 1969 Plymouth Furys. 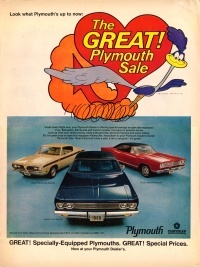 This GREAT Plymouth Sale print ad made people aware of the 1969 special offers. 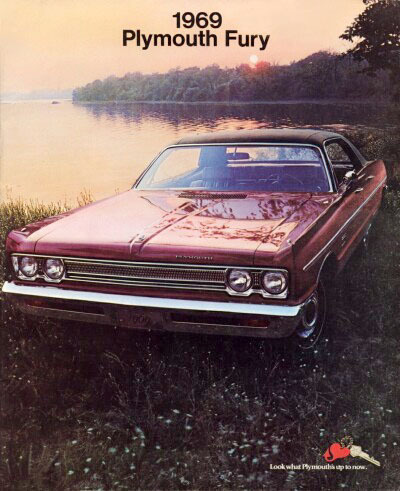 This image of a 1969 Plymouth Fury Sport Fury two-door hardtop is from the corporation's annual financial report. 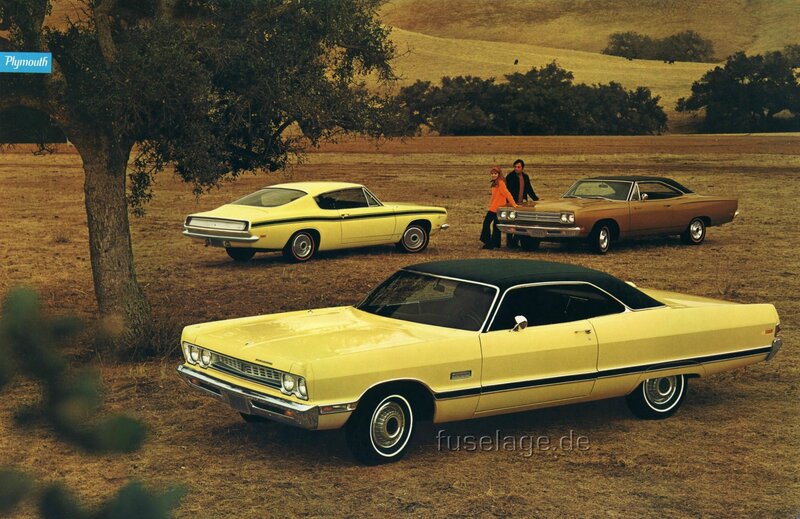 Press Photo of a 1969 Plymouth Fury III four-door hardtop. This is the TV commercial that accompanied the above orint ad. 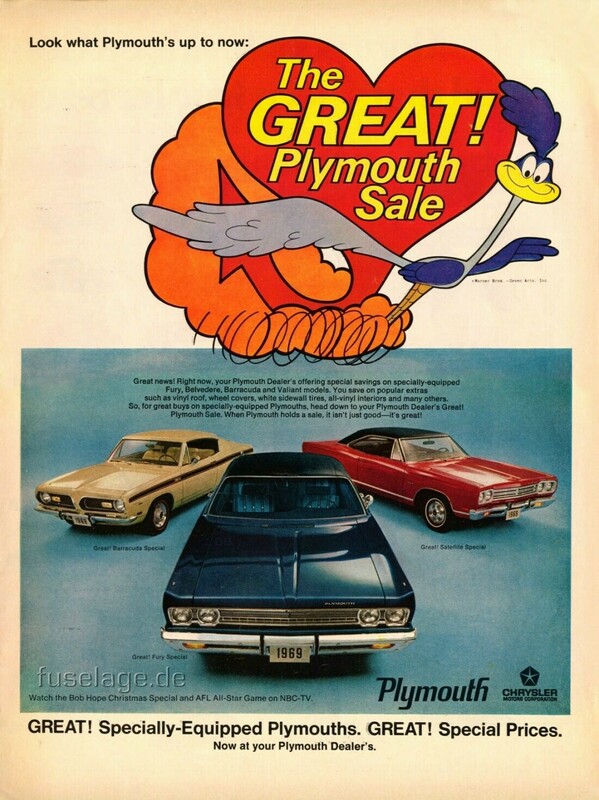 Download this 8 MB "C-body" of an .avi-file for the GREAT Plymouth Sale and watch the Road Runner and Coyote whirl around cars in a showroom. Note: If you experience problems with Windows media player waiting for data, try this: right-click on the image and select "Save target as". Thanks to B�la Kiss from Hungary for this rare piece. 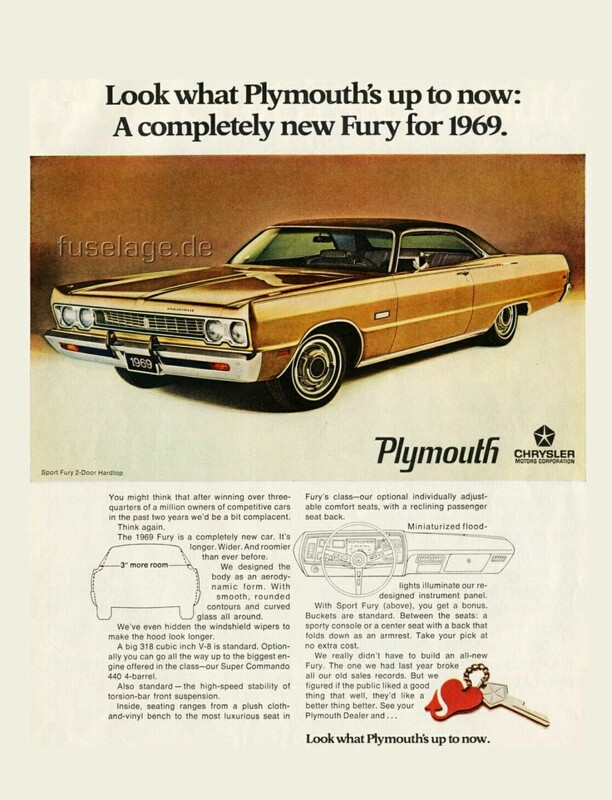 One of the first advertisements, introducing the all new 1969 Plymouth Fury. 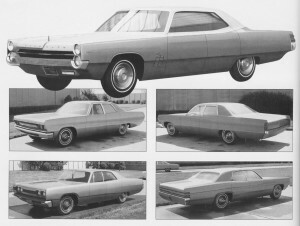 These are images of clay models showing different design approaches for the new 1969 Fury models as they were being evaluated in the Plymouth styling department.